Talune St, Lindisfarne ended at the edge of the Derwent River, so I turned right to follow a pathway. At 11.45am the pathway continued along an extension of Paloona St before changing back into a shoreline Trail. Further on and next to the Clarence Foreshore Trail, an attractive weatherboard house named ‘Gask’, with an expansive enclosed verandah framing extensive Derwent River views, attracted my attention. Apparently this home was built in 1900 as a holiday residence for Dr William Crowther (but more research required confirming this because birth dates and the house dates do not make a suitable match). The property, originally named Villa Rose was renamed Gask, although I can find no explanation for this name. In 2010, the house was sold for over ¾ million dollars. The Trail continued past the sweeping Koumala Bay where I watched the camouflaged catamaran speed past carrying its cargo of visitors from MONA to the city. In the photo below I have almost walked to Limekiln Point and the headland in the distance is Bedlam Walls Point. 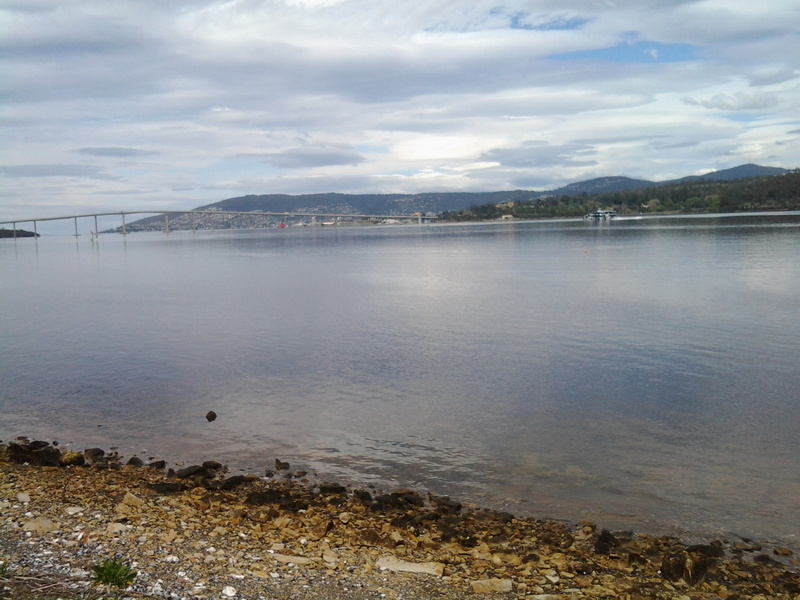 Limekiln Point is the southern location which corresponds with the northern Bedlam Walls Point across the other side of the gap where the Derwent River meets the waters of Geilston Bay. At Limekiln Point I saw no remnants of any limekiln. 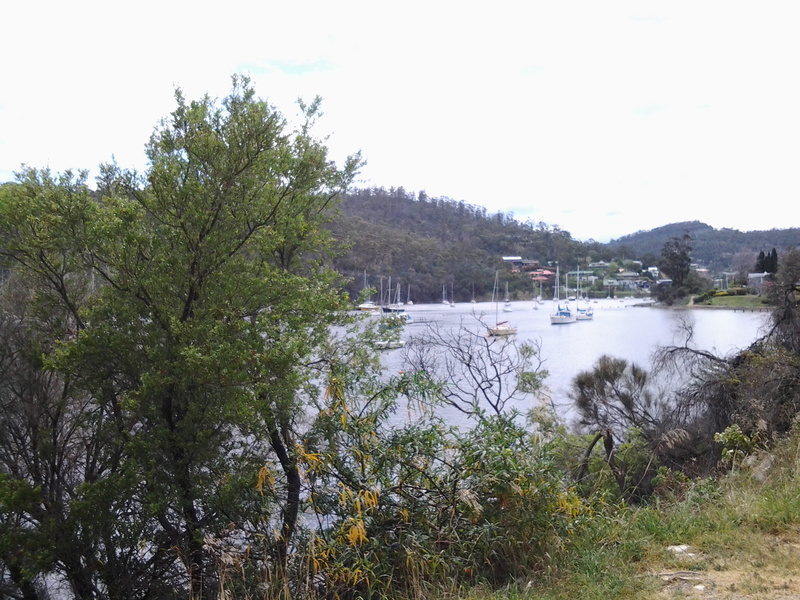 Apparently Geilston Bay was initially named Lime Kiln Bay, so perhaps the lime works were centred around the curve of the Bay (more research required). Bedlam Walls Point will be the official starting point for Stage 6 of walk along the Derwent River. 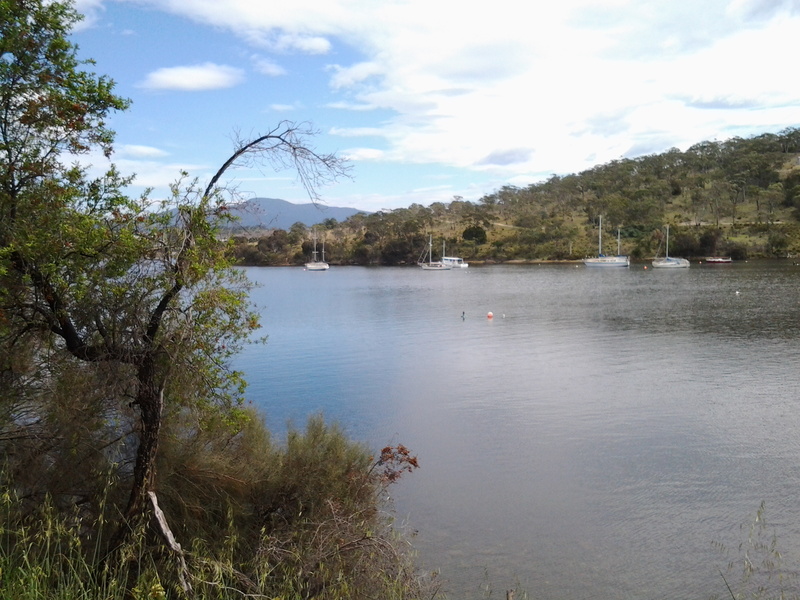 At midday, approximately 1km of my walk to the Geilston Bay Regional Park remained. The Trail became a gravel track, and while parts of the track earlier would have been suitable for someone using a wheel chair or crutches, much of the last 1000 metres of the track was better suited to mountain bikes, despite not being very hilly. Gardens cascaded down to the edge of the path and private uphill stony stairways ended in gates and fences. Jenny Wrens flitted through the undergrowth. Raucous sulphur crested cockatoos flew screeching overhead. Colourful. Tranquil. Glistening light. Far from the maddening crowd (with apologies to Thomas Hardy). A perfect day. 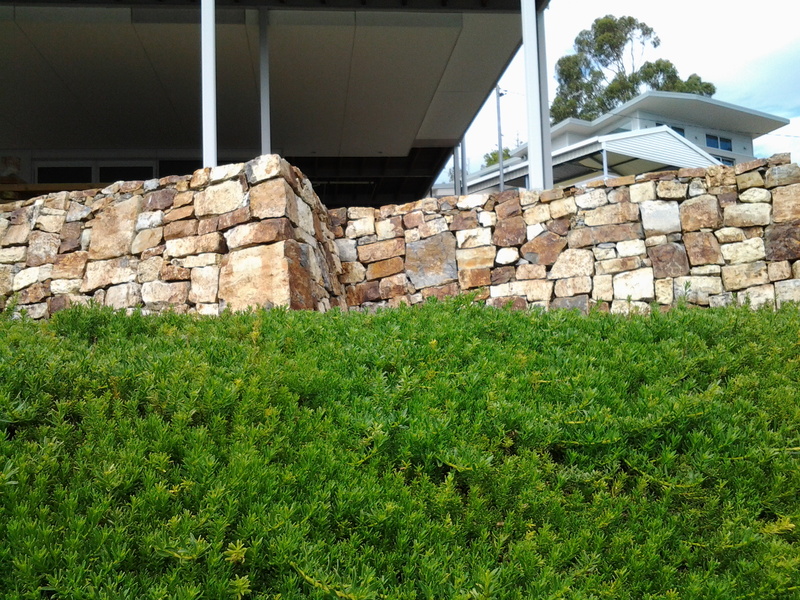 I appreciated the skill in building a dry stone wall. Sighting the first massive almond tree filled with growing fruit was a surprise, and then when I saw a few more I was amazed. Obviously, these were self-seeded and reseeding. All growing between the Trail and Geilston Bay’s water edge. I wonder when they will be ready to pick and eat. Perhaps December or January? Since they grow on public land, it will be a matter of first in first served. 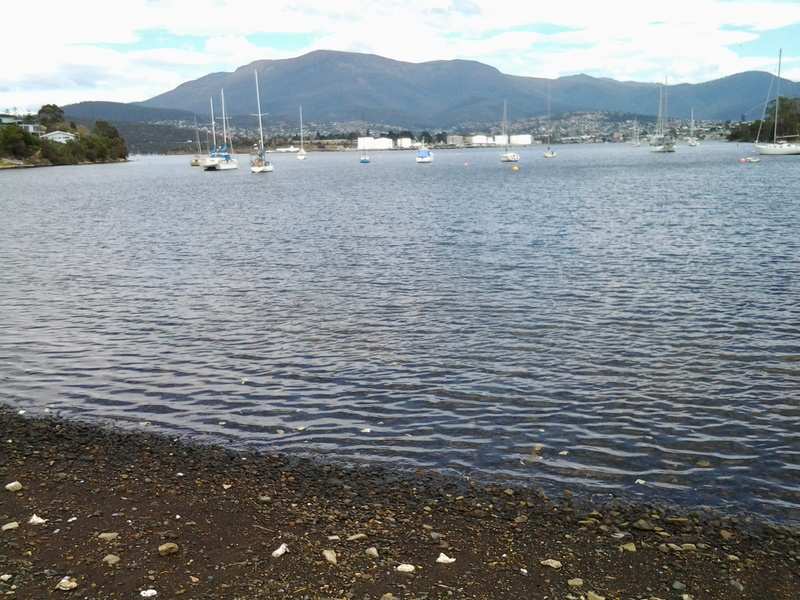 Eventually the gravel pathway met with a formal Foreshore Trail and I continued around the Bay until I spotted a bench on the grey weathered wharf in front of the Geilston Bay Boat Club. 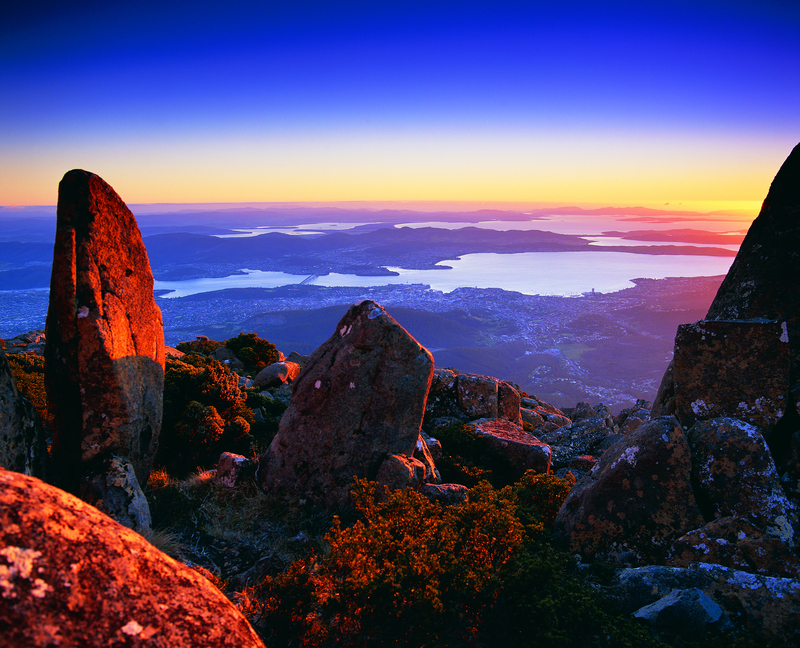 It was time to enjoy the view of Geilston Bay, Hobart city beyond and the ever present Mount Wellington. Friday’s walk was an easy simple experience and since it passed places, streets, and vistas I had never seen before, I loved it all. 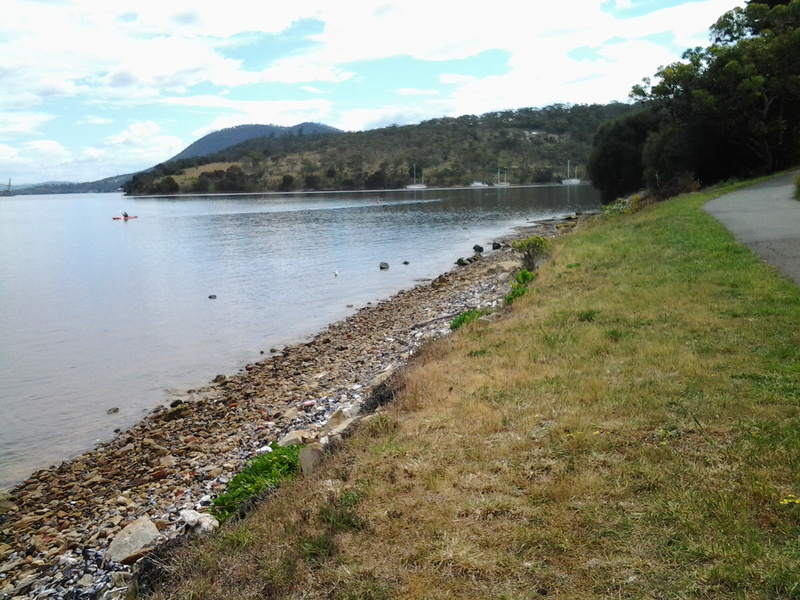 This entry was posted in Derwent River, Hobart, Mount Wellington, Walking and tagged Bedlam Walls Point, Clarence Foreshore Trail, Gask, Geilston Bay, Geilston Bay Boat Club, Hobart, Koumala Bay, Lime Kiln Bay, Limekiln Point, Lindisfarne, walking, William Crowther on October 13, 2014 by Tasmanian traveller.